When you're born with the last name Pick, it's only natural to use it in cliche ways, such as titling your selections for the raddest music to check out in Bend this summer. Here are a few of my can't-miss picks for an awesome summer of music. Cold beverages. Booty calls. Paul Simon covers. What's not to love about G. Love and Special Sauce? The hip-hop-meets-blues-meets-rock band led by Philly's Garrett "G. Love" Dutton brings the sunshine and booty shaking to the Century Center for a highly anticipated party. Look for my interview with G. Love next month! Speaking of Simon, perhaps the biggest show of the summer brings Garfunkel's better half to the Amphitheater. And while the show may have sold out quickly, that doesn't mean you can't find a friend with extra tickets and convince them to give them up. Knowing the Simon catalogue, it'll be worth it to cross this heavy hitter off your concert bucket list. Central Oregon's favorite homegrown punk-meets-bluegrass boys come back together for a rocking night of music headlining Summerfest. If you haven't seen The Flask before, don't miss this opportunity to catch the upbeat, high-energy performance. From "Ebb and Flow" to "Pandemonium," you'll be dancing, thrashing and swaying to the beat all night. Way back when, The Autonomics used to play at JC's and would have to wait outside between sets because they weren't 21 yet. The trio started at Summit High School and have since moved to Portland to further their musical pursuits. The indie rockers blend surf punk and rock with catchy party hooks that will have your body shaking in the best possible ways. San Francisco's gypsy-pirate-polka rockers Diego's Umbrella hold a special place in my heart. Not only have I danced my booty off, resulting in the best kind of concert sweat, but I've had the pleasure of playing Scattergories with these dudes after their Summerfest performance a couple years ago. Scattergories skills aside, if you want to get down to Jake's party drum, swoon to Jason's excellent violin solos, or dance to the "Hava Nagila," Diego's Umbrella provides a guaranteed good time. This. This is the show I'm most excited about. The Avett Brothers, who I've seen at Edgefield three times, finally play in our backyard. 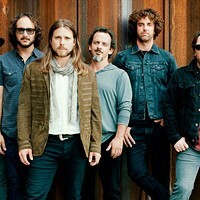 Their latest album, "True Sadness," continues their folk-rock traditions and strong songwriting. From their heartfelt crooning on "I and Love and You" to energized renditions of "Ain't No Man," The Avett Brothers do not disappoint. Go! Buy your ticket now! What are you waiting for!? The first time I saw Portland-based indie rock kings Modest Mouse was my freshman year of college at the McDonald Theatre in Eugene, in the height of "Float On" fandom. Now, Isaac Brock and company return in support of "Strangers to Ourselves," their 2015 LP. Fingers crossed we get to hear "The World at Large!" "Garden State" ranks among my very favorite movies and the soundtrack, which features several of The Shins' most popular songs, constantly lives on my record player. James Mercer returns from a jaunt with his side project Broken Bells with The Shins' latest album, "Heartworms." Don't miss this opportunity to see the band in a more intimate setting at the Athletic Club. Plan ahead, this one will definitely sell out!